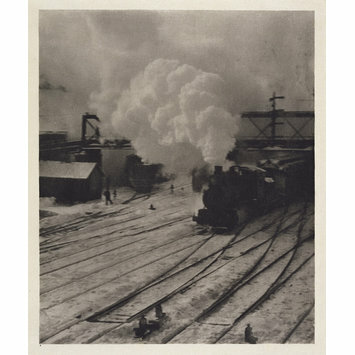 Alfred Stieglitz was a pioneer of modern photography. A photographer, publisher, writer and gallery owner, he played a key role in the promotion and exploration of photography as an art form. He also helped introduce modern art to an American audience. In 1902 Stieglitz established the ‘Photo-Secession’ – a society of carefully selected pictorial (the term ‘pictorial’ referred to the artistic aesthetics of contemporary painting) photographers, which operated until 1917. This image of a train steaming towards the camera is a comment on the magnificent power, yet also the beauty, of the machine age. With its lack of sharp focus it is a typical example of the pictorialist style, which dominated during the late 19th and early 20th century. The photograph was printed for the quarterly photographic journal Camera Work. Stieglitz published Camera Work (1903–1917) with the editorial purpose of promoting the ideas of the ‘Photo-Secession’ and establishing photography as a fine art. The first issue was printed in December 1902, and like all of the subsequent issues it contained beautiful hand-pulled photogravures, critical writings on photography, and commentaries on photographers and exhibitions. In 1905 Stieglitz then opened the ‘little galleries of the Photo-Secession’ in New York at 291 Fifth Avenue, which later became known as gallery ‘291’. 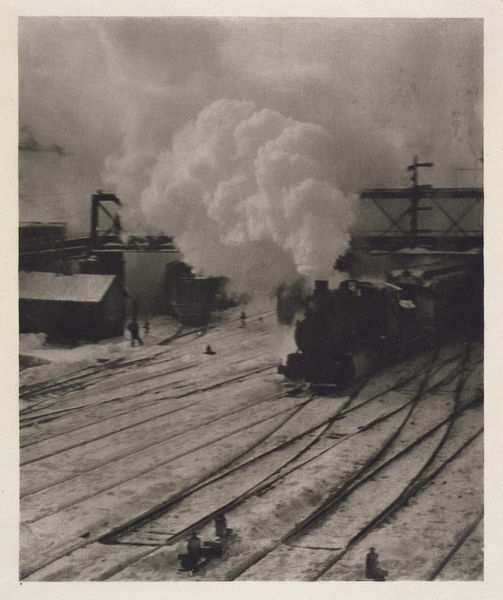 A photograph of a train on the tracks of a railyard with steam coming from the engine.